The first-generation Figo is still one of the best handling hatchbacks India has seen so far. After all, it's a Fiesta Mark V underneath. The new Figo uses an updated platform based on the older Figo but gets engines that are a lot more powerful. We decided to test the 1.5-litre petrol model. The former is the second car in this test after the Volkswagen Polo GT TSI to use an automatic transmission. The petrol motor puts out 112PS at a rather high 6,300rpm. The gearshifts are slow despite featuring a dual-clutch transmission. Like the Polo, the gearbox takes time to offer a downshift, taking the fun right out of an otherwise capable petrol motor. The Figo uses two tiny buttons on the right side of the gear knob actuated by using your left thumb. This meant we had to one-hand steer while trying to downshift before corner entry. The delay in downshifting meant one had to keep clicking the gear change button repeatedly before the system finally decided to drop a gear. This also piles on a few seconds, which means the whole point of shifting manually is wasted! The steering is more vague than the Hyundai i20 on the racetrack. Aditya found the steering to be positioned a bit ahead too. The traction control system is way too intrusive even when turned off. It's a great chassis and could have been better if the system turned off completely. Braking is weak and the rear end of the car tends to move around while doing so. It isn't a sensation one likes to experience, especially when one is braking from triple-digit speeds to a slow corner like C1 at Kari. Add to that an ABS unit that intervenes way too early and you're left being too gentle on the brakes with laptimes taking a massive hit. Despite the slow transmission, the high power to weight ratio makes the Figo petrol quicker than the i20 and Jazz petrol. But why are you reading about the car towards the end of this comparison? 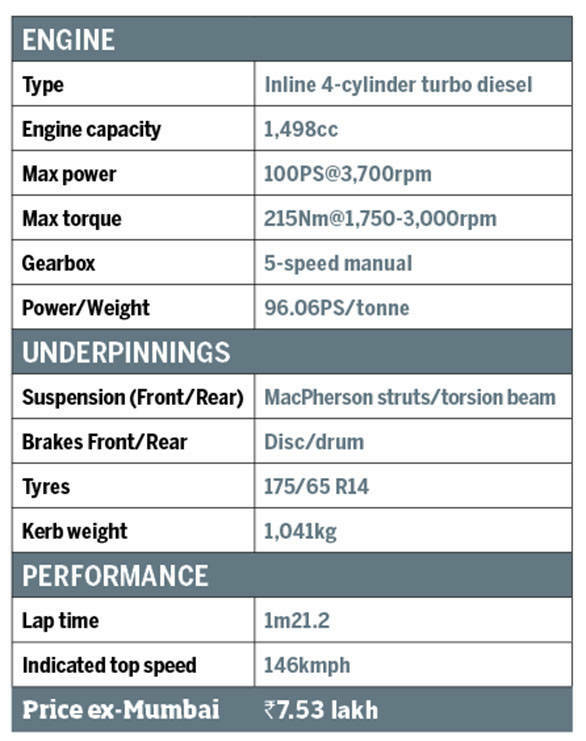 That's because this test also features the diesel-powered Figo. It also features a 1.5-litre motor and it puts out 100PS of max power and 215Nm of torque available from a low 1,750rpm. There's no traction control system, and it uses the same nimble chassis as its petrol sibling. Around Kari, the car feels the lightest among the diesels and pulls well out of corners even in third gear. Power delivery is strong throughout the rev range. Despite smaller and narrower tyres than the rest, the car grips surprisingly well. 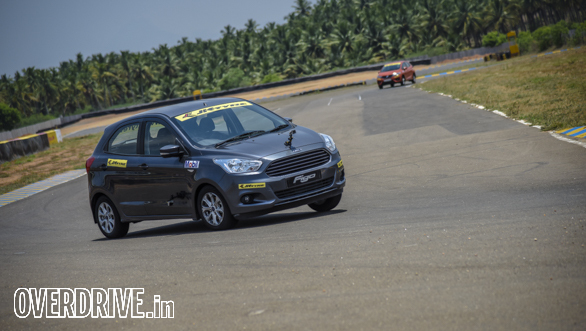 The Figo diesel oversteers slightly on corner entry and then understeers at the exit, making it quick around the track. It isn't the most entertaining car of the lot, but I found myself driving this car around the track the most. And then everyone else fought for the keys as the Figo diesel went on to surprise everyone by beating the Punto Abarth by 0.1 seconds! The even bigger surprise was that the diesel Figo matched the Fiat Punto Abarth's 151kmph top-speed down the main straight. Never has there been a better example of David taking down Goliath! Bertrand D'souza: Now here is a curious case of one brand whose variants sit poles apart. The petrol Figo seems a laggard but is in reality let down by that terrible gearbox, and it's supposed to be a dual-clutch automatic. The chassis otherwise is phenomenal. 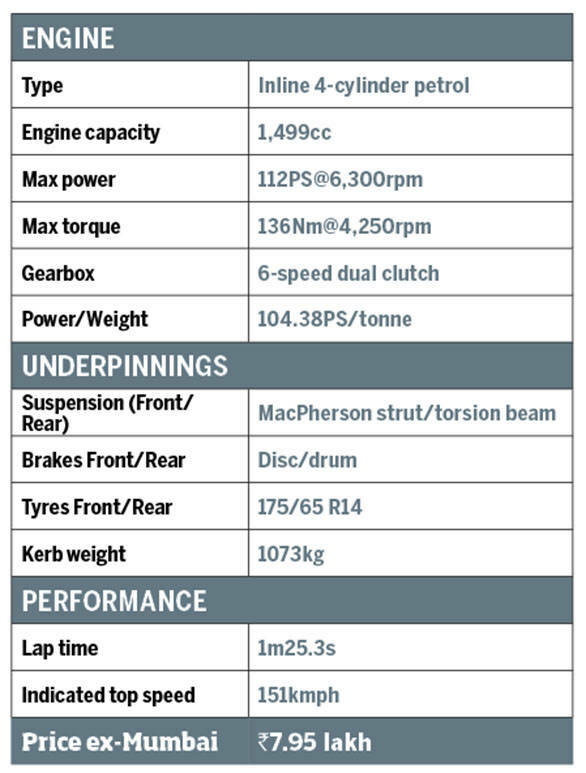 It's easy to see how that chassis and the diesel powertrain easily match up to get the quickest times on this test. Of course, it also helps if that chassis allows you to transition through the corners in the smoothest manner possible. Minimum fuss, maximum output! 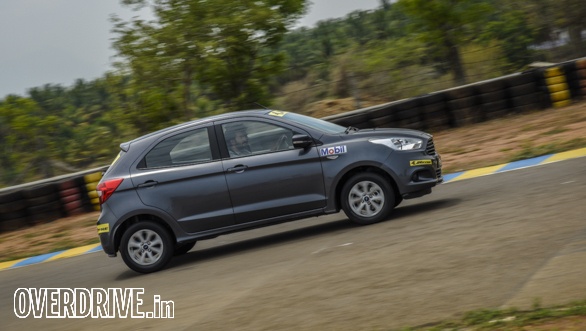 Rishaad Mody: Both the Figos have a lovely chassis set-up with great front end feel and a rear that isn't shy to move around. The petrol is let down by its gearbox that simply doesn't want to downshift and a traction control system that refuses to fully turn off. The diesel though feels far more powerful than the numbers suggest and never needed less than third gear. The only negatives are the artificially light steering feel and overenthusiastic ABS. Still, none of us expected it to go so fast. Well done!